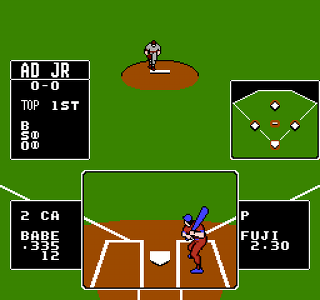 My childhood memories of playing baseball games on the Nintendo are dominated by Bases Loaded with its TV-style presentation, RBI Baseball, and the horrible and unimaginatively-titled Baseball. Although I never played it (or even remember hearing about it) back then, in the time since the NES has faded into obsolescence Baseball Stars has risen above the crowd to become the definitive baseball game on the NES. This is undoubtedly because it has more game play options and more personality then any game based on America’s Pastime appearing on the Nintendo. One of the best things about Baseball Stars is its marquee team, the American Dreams. Although the game lacks an MLB or MLBPA license, no true fan of baseball needs to ask who “Babe”, “Lou”, “Willie”, or “Sandy” are. Other teams include the Ghastly Monsters with “Freddy”, “Jason” and “Cyclops”; and the World Powers, featuring “Caesar”, “Plato”, and “Zeus”. My biggest gripe with most baseball games is that the fielding is harder than it needs to be. That’s still true with Baseball Stars, but it went a long way towards improving the defensive aspects of the game. Fielders are faster, and more importantly they can dive, jump, and even climb the outfield wall. Another problem with most sports games from the 8- and early 16-bit eras is the lack of depth caused by an inability to play through a season. Once again Baseball Stars solves this problem by offering league play and battery-backup game saves. You can even create your team, hire, and upgrade your players with money earned after each game. I could go on and on about how great this game is, but if you don’t already have it, just buy it. It’s the best commonly available baseball game on the system by far, and is eclipsed only by its less common and more expensive sequel. Buy Baseball Stars on GameGavel or Amazon. Tagged Baseball, Baseball Stars, NES, Nintendo, Review, Romstar, SNK, Sports. Bookmark the permalink.